The furniture placement got delayed a bit. I’m hoping it will be done today. I’ve gotten requests to post pictures, which I will be happy to do when it’s done. In the meantime, The Girl and I went through a bucket that was in her room. She has got this process down. The Girl kept a stack of books and donated a few. A lot of paper went to the recycle bin. She kept a couple of blankets, her Nintendo charger and some artwork from the school year, which will be addressed another time. The donated items will be picked up by the Leukemia and Lymphoma Society this Saturday. They come to my house regularly. And this poor little lovey got its nose eaten off by Eddie. It’s not in a condition that can be donated or kept. So, thanks to Hannah who commented on a post I put on The Simple Year Facebook Page, I learned about textile recycling and this sad little guy will be headed there. I found out that American Textile Recycling Services, Inc. has locations in my area and all over the United States. They apparently have over 3,000 drop off locations across the country. Want to find one near you? Go here. I emailed them and they very quickly responded with a list of drop-off locations near my area. And by list I mean a spreadsheet with 35 locations on there. 8 of them were highlighted in yellow with the locations closest to me! They also attached a receipt. They couldn’t have made it any easier. There is a donation bin less than a half mile from my house, so we’ve got a bag we are filling up with holey and stained clothes and half-eaten loveys. They take shoes, toys and household items as well. Sweet! Where do all of the recycled clothing and shoes go? I can totally get behind this. And until a few days ago, I didn’t even know it existed! While I’m at it, I know we’ll need to recycle old phone chargers and other electrical type cords. Anyone have a suggestion for where to take or send those? 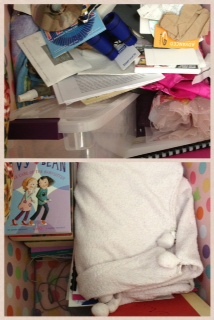 This entry was posted in Uncategorized and tagged Bedroom, recycle, Simple Year 2. Bookmark the permalink. Wow, I am thrilled beyond words that you are donating to the Leukemia Lymphoma. Society. They are the ones who give me a grant each year to help pay for copays, and some insurance reimbursement. I have myeloma( doing well, thank you all!) so the more info about how much these people do is incredible. For all you runners out there, theLLS has a running team called Team continuum . They are at all the big marathons and just out there raising money and awareness about blood cancers. Thank you. So much , it just made my day! Glad to hear all is well with you! LLS is great – they come to my house, send me reminder emails – it couldn’t be easier. Tahoe girl, could you please send me some information? Good sites, etc.? My mom and my paternal grandmother had multiple myeloma. I was young when my mom was diagnosed(my grandmother had passed long before I was born), and I never knew much about it. I’d love to hear more about LLS. I use an acor list serve for MM. You go to the cancer society and there’s a drop down for which cancer. Then you sign up. It has been extremely useful and you learn all kinds of things and of course can ask questions. The second is a private Facebook MM group. Go to face book put in MM support group. Also, have to ask to join. Very friendly people and also lots of info. Thirdly, there is the Myeloma beacon. They are terrific and I think that is where I learned about the LLS grant program,. Pat Killingsworth has a great blog,I’m not sure of its exact name. I’ll get it for you. Multiple myeloma is not hereditary , good for you, but there may be environmental factors involved. You might want to be sure you get periodic blood tests, especially to target your proteins. You can be what’s called smoldering myeloma for years. I ,like many others, had never heard of it,but I’m convinced it was environmental from childhood. You can click on my name above and it will take you to my blog! I’m not sure about in the US, but here we have e-waste collection places that we can drop off electrical goods in ill repair. If the cords and chargers still work try Freecycle or even eBay. I regularly hunt eBay trying to find a second charger and a car charger for my phone! Thank you for the textile recycling info. Lately I have been convinced that unwearable clothes/shoes should not be donated to charity, but it sounds like ATRS can use everything. Their one California location is not feasible for me right now, but I see they’re coming soon in L.A. County. Your chargers, cables, etc. should go to an e-waste roundup. In my area, these are organized on college campuses and/or sponsored by cities and counties. Hope you can find one nearby. I always benefit from reading your posts, tho I don’t always take time to reply. Carry on! I know that our Best Buy has a large bin with many categories of electrical things to recycle (unsure if chargers and chords are one of the categories. I vote for Freecycle. I am so glad that you posted about ATRS. I just collected a large bag of clothes that I either didn’t get a chance to mend before the teenage daughter who gave me that “ooh, not in style anymore” nose wrinkle or had a stain that got “baked” in in the dryer and I was too lazy to do that get any stain out process. I’m having another big purge sale they wouldn’t have made the cut to resell. I’m going to look them up this evening. Thanks a ton!! BTW I’m reading a really great book called, What’s Mine is Yours, The Rise of Collaborative Consumption. I highly recommend it. I have no idea where I heard about it, probably on some blog rabbit trail I was on. GREAT JOB on all the work you’ve been doing, thanks for sharing. Oh, Best Buy. Great idea. And thanks for the suggestion on the book. I’m always looking for new reading material. your daughter must feel a sense of accomplishment! I know I always do go through drawers and closets. 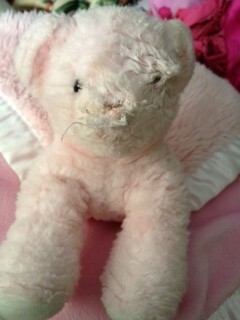 And, the poor stuffed animal – how pitiful! WHAT? I had no idea textile recycling even existed! Nothing in Oregon for this particular company, but I see an internet search coming on… Thank you! If there is not a dedicated Textile recycling place in your area check with Goodwill. Often their stores will take bags of textiles not good for resale and pass them on for a small profit for them. I just bag the clothes separately and note on the bag that they are rags. Or your local Humane Society or animal rescue can use all the old rag rugs, towels and stuffed creatures you have. The animals need stuff to play with and line their pens until adopted. Our local society will take all towels and rugs, no matter the condition, as long as they are clean. Thanks for the suggestion about Goodwill and for the local Humane Society! My pleasure! I was very excited to discover it. Wow! This is fantastic, thank you for sharing! The items I had that were too stained or too worn just ended up in the landfill. I love that there is another source for these items.